The icing on the cake is that in the week or so between filming and uploading the value of SMART is going up and up, so the actual values of SmartCash mentioned are now higher! Indeed, I plan to shoot some smartcash vlogs very soon! Σ$$$ Tipped @colinhoward Σ10 SMART! Comment @smartbot help to claim. Currently the price of SmartCash in the market is $0.968 USD per SMART. Current value of the tip is $9.68 USD. To find out more about SmartCash, please visit https://smartcash.cc. Looking forward to watching them mate!! Σ$$$ Tipped @simplifylife Σ10 SMART! Comment @smartbot help to claim. Currently the price of SmartCash in the market is $0.968 USD per SMART. Current value of the tip is $9.68 USD. To find out more about SmartCash, please visit https://smartcash.cc. You have Σ45 SMART (unconfirmed: Σ0 SMART). Hey @briandenver do you have the latest version of the desktop wallet? If not you might need to update! You won't loose your coins, just make sure you have your private key somewhere safe! Thanks for making these videos, I am really excited about where Smartcash is going. Seems like an excellent project. Thanks for explaining alternative ways to earn Smart! Σ$$$ Tipped @kengin2013 Σ10 SMART! Comment @smartbot help to claim. Currently the price of SmartCash in the market is $0.968 USD per SMART. Current value of the tip is $9.68 USD. To find out more about SmartCash, please visit https://smartcash.cc. Would it count if the idea of the post I'm about to write about smartcash has already been written by someone else. I love every of your videos, ma'am. If it is in your own words and not too identical then it will be ok.
Nice video. I really like to know what makes good content? How do I get people to comment? one of the best team on steemit! team SMARTCASH! thank you @markjason :) appreciate it!! Σ$$$ Tipped @markjason Σ10 SMART! Comment @smartbot help to claim. Currently the price of SmartCash in the market is $0.856 USD per SMART. Current value of the tip is $8.56 USD. To find out more about SmartCash, please visit https://smartcash.cc. hey, very interested in smartcash. Can you give any info on what is going on with smartcash on cryptopia? Thanks for the video! Σ$$$ Tipped @rumble Σ10 SMART! Comment @smartbot help to claim. Currently the price of SmartCash in the market is $0.795 USD per SMART. Current value of the tip is $7.95 USD. To find out more about SmartCash, please visit https://smartcash.cc. You have Σ10 SMART (unconfirmed: Σ0 SMART). Σ$$$ Tipped @cryptosignal1 Σ10 SMART! Comment @smartbot help to claim. Currently the price of SmartCash in the market is $0.795 USD per SMART. Current value of the tip is $7.95 USD. To find out more about SmartCash, please visit https://smartcash.cc. Thanks for the info Hannah, keep promoting SmartCash! Of course! Looking forward to more. Σ$$$ Tipped @andy4475 Σ10 SMART! Comment @smartbot help to claim. Currently the price of SmartCash in the market is $0.856 USD per SMART. Current value of the tip is $8.56 USD. To find out more about SmartCash, please visit https://smartcash.cc. @andy4475: Σ9.99 SMART has been withdrawn from your account to SgbJf72tpegFAWLxMnBXwdcg9U2R5xmRa9. You have been charged Σ0.01 SMART withdrawal fee. Transaction 1f2ab4c883af11925143ebec7471005cd6dc5fcd84570b77a1a3866b9e81a814 is now completed. To monitor the transaction status click HERE. @hannahlicious Yes, finally 😀, it has transferred to my SmartCash web wallet ~ Thank you so much Hannah 😘👍🕺🕺🕺 you rock girlie ! Nice post on smartcash and the crypto currencies. Keep posting more often. Smartcash have great potentials, would love to make a great content some day(if it can be actually great). Just followed Team Smart but the link to join the discord group is not working. I really want to be part of that group also. Awesome video! 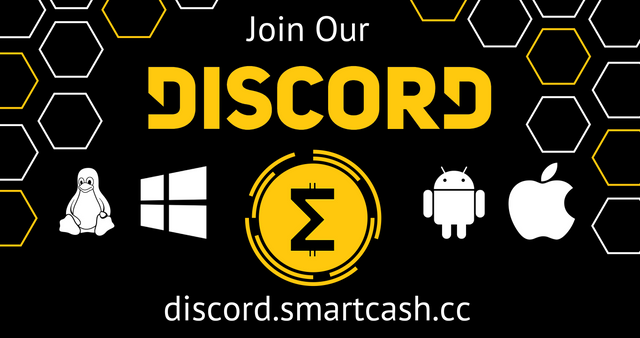 And I'm really interested in Team SmartCash, so I'll definitely join on discord to see what's going on. Can't believe I haven't heard about it yet! Well, I can definitely confirm that what makes SMART different is the intention to make the community part of its value. Well, I'd be still happy to see certain topics you suggest. Writing a post about SMART sounds a bit general.